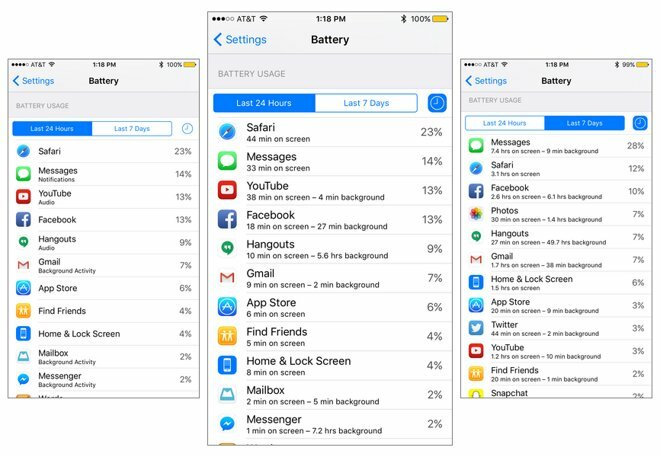 Upon upgrading to iOS 9, users will gain immediate battery life improvements, Apple says, thanks to a number of system-wide changes. According to the company, there have been tweaks to the platform, its apps, and key technologies. But the company has also included a brand-new Low Power Mode to extend battery life even further. 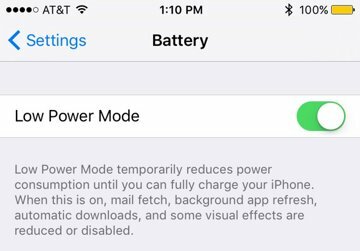 Users are automatically prompted to turn on Low Battery Mode once their iPhone reaches 20 percent, and again at 10 percent. But this new feature can also be manually enabled at any time, including when the battery is topped off at 100 percent charge. To enable Low Power Mode, open the Settings app in iOS 9, then choose the new Battery parent menu. From here a toggle switch for Low Power Mode can be turned on. Once enabled, Low Power Mode changes the battery indicator in the top right corner to yellow, reminding users that their device is running in a more efficient state. Low Power Mode enables the Battery Percentage display in the upper right corner by default, and this cannot be turned off. Apple's new Low Power Mode reduces power consumption by turning off certain features, including mail fetch, background app refresh, and automatic downloads. In addition, some visual effects are reduced or disabled to squeeze more out of the device's battery. Low Power Mode is also said to affect networking capabilities to boost uptime. Benchmark tests of iOS 9 have found that Low Power Mode also drops the processing power on an iPhone's chip by about 40 percent. The result is a slower— but longer-lasting— iPhone experience. With iOS 9, Apple promises up to one hour of extra battery life using a combination of power saving tactics and new technologies. For example, iOS 9 will use ambient light and proximity sensors to check when an iPhone is facedown on a table, preventing the screen from turning on.